This cookie is based on a recipe from Elinor Klivan’s book “Big Fat Cookies” and as you’d guess, the cookies are quite large. Fat? Not really, but they’re not super thin, either. Either way, they are excellent and definitely worth a try. Along with being big and sturdy enough to wrap for bake sales, they have a decent amount of healthful ingredients such as walnuts and oats. And speaking of walnuts, they work really well in these cookies because the cookies themselves are fairly sweet. Preheat oven to 350 degrees F. and have ready a couple of parchment lined cookie sheets. Stir together flour, baking soda, salt and cinnamon and set aside. In a mixing bowl, beat butter and both sugars until fluffy. Add eggs and beat until combined. Stir in vanilla extract and maple syrup. By hand or using lowest speed of electric mixer, stir in flour mixture. 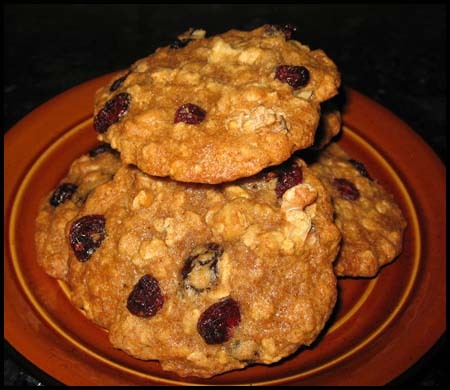 When flour is absorbed, stir in oats, cranberries and walnuts. Using a quarter cup measure, shape dough into large mounds and place mounds 3 inches apart on lined cookie sheets (OR, you can do what I do and scoop out the individual mounds, chill them as mounds, then refrigerate or freeze the mounds until you are ready to cook them). Bake one sheet at a time for 15-17 minutes. Let them cool on the cookie sheet until firm enough to lift off, then allow them to cool completely on a rack. Thanks for all the interesting changes and tips! I’ll be sure to try your version one day. I used whole wheat flour instead of all purpose flour. They baked very quickly, so BE CAREFUL! My first batch in the oven got a little charred on the bottom. Never burned a baked good before, so I was a bit annoyed at myself for not keeping a closer eye. The second and final batch came out fantastic! I found my new Oatmeal cookie, better than my Mom’s! Next time I make them, chocolate chips may find their way in or replacing the cranberries with raisins. But like I said, it all depends on what’s in the house when I get the urge at 10pm at night. I am baking these as we speak and they smell amazing!!! I intend on bringing them to a friends for desert tonight. I am not a huge chocolate lover so I can not wait to try them with cranberries. I cut the maple syrup in half so hoefully they will still come out as amazing as they look and smell. : ) Thank you! I am baking these as i type, and they smell fantastic!! thanks so much for the recipe, i left out the cranberries and added chocolate chips and am hoping they will look as good as yours! i would like to try these…but could I leave out the maple syrup??? They sound kinda sweet..but they sound very good…would this alter the recipe much? I made these cookies as bars and frosted them with a maple glaze….1 cup confectioners sugar, 1/4 cup maple syrup, 2 tsp. milk. YUM!!!!! Has anybody ever made these cookies as bars. I was thinking of baking them as bars and the putting a glaze on top….comments??? Nope. Never tried Splenda in this recipe. If you try it, let me know how it works! Hey there Anna… While cruising Costco today, I came across a tub of Nestle’s ready-made Oatmeal-Cranberry Cookie dough and said “hey, I can do that myself”. Came home and googled and found this recipe. Looks great. I am wondering if you’ve tried Splenda as a sugar-sub to help cut down on the sugar/carb amount since Maple Syrple is used and looks to help make it a sweet cookie. Thanks for your prompt reply Anna, I believe I’d underbaked the cookies! The only substitution was I used currants & raisins instead of cranberries ! =P The cookies taste great nonetheless, I’ll try out your crunchy chocolate cookies soon! Yum!! Usually mine come out chewy on the inside and crispy around the edges. Did you make any substitutions? Cut sugar? Use margarine in place of butter? Sometimes little things like that can affect the texture. Or maybe you just needed to cook them a little longer. They aren’t really supposed to be crispy all the way through. I should have done a better job describing the texture. Hi, absolutely adore your website!! I baked a batch of these today and they taste really yum. I was however a little disappointed ’cause I’d thought they were crispy cookies as opposed to soft, chewy ones. Are they supposed to be soft and chewy or did I mess up somewhere? How can a person print an individual recipe? There, I altered it just for you, Leslie. Now if anyone makes these with quick cooking (which aren’t the same as instant), let us know. Good question, Leslie. The book says “Not Quick-Cooking”. So I took that to mean you could not use Quick Cooking and definitely not Instant so I said no for BOTH. However, I’m thinking maybe the author meant “Not Instant” when she said “Not Quick-Cooking”. Instant oatmeal could ruin certain types of cookies. Quick Cooking will just give them a different texture. When I make oatmeal cookies, I use quick-cooking oats. Why can they not be used in this recipe? Toasting enhances the flavor nuts and oats. If you have time, you might want to try toasting the oats. I’m not so sure I recommend pulverizing them, though. I intend to make these cookies and wonder if you could comment on whether you think toasting and pulverizing the oats would be an enhancement to the texture of this cookie. Thank you for your comments. Maple Grove Farms comes out of St. Johnsbury Vermont and they have such a big plant, that’s why it’s more economical than some other maple syrups that come out of very small sugaring operations. Nice place – was only a couple of hours from where we used to live. We visited there several times. I checked the name of the brand I use and it’s called Maple Grove Farms. It’s a good every day maple syrup. I buy my maple syrup at BJ’s Wholesale Club. You can get a huge jug for maybe $12.00 or so. Worth the splurge as pancake syrup is nasty! Emilie, I used pure maple syrup, but it wasn’t an expensive brand. It costs about $3.50 a bottle. Cookiechick, Elinor is my new cookie hero. Isn’t she coming out with another book? I thought I saw an ad in Bon Appetit for a new chocolate chip cookie book or something. Wow! They look terrific – I’m sharing this with Elinor, she’d be thrilled to have made an appearance on your great site! Keep up the great work and thanks for sharing! Oh wow! I was thinking an oatmeal cookie sounded good. Did you use pure maple syrup? I bought some maple syrup last night, and you know how much it cost me? $5.00! The bottle isn’t even that big. Anyway, these look really good, and I will have to try them.